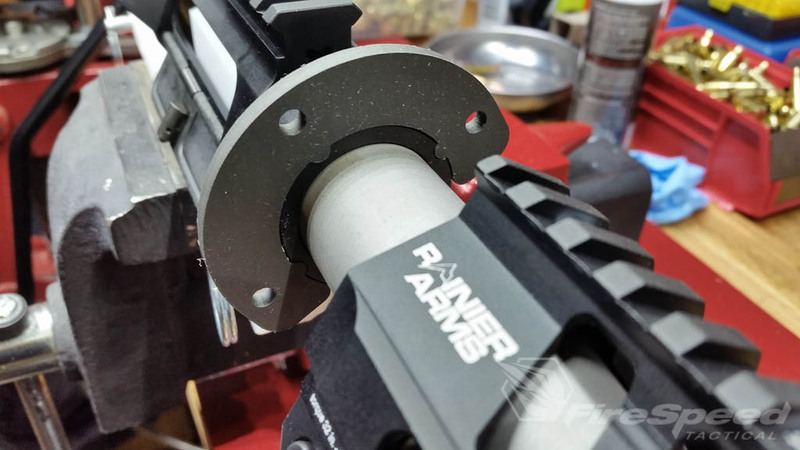 I had a hard time deciding one what to write about first, the difficulties I had installing the Rainier Arms Switch handguard, or the success I attained with Gem State Armory’s Wrench. I guess for this one I will start with the problem that introduced me to one of the best wrenches on the market! So we were putting together a 308 upper and decided to use the new Rainier Arms Switch handguard which is made by Fortis MFG. in WA. The difference is minute, the Rainier version just has an awesome angled cut in the front similar to diamondhead’s handguard, but in a lighter fashion. The Switch handguard has a lever to lock the handguard onto the proprietary barrel nut that came with the handguard. This way if you wanted to change out handguards, you can. I don’t know why you would want to change between other switch handguards, so if any of you have an idea why you would, PLEASE comment and let us know! 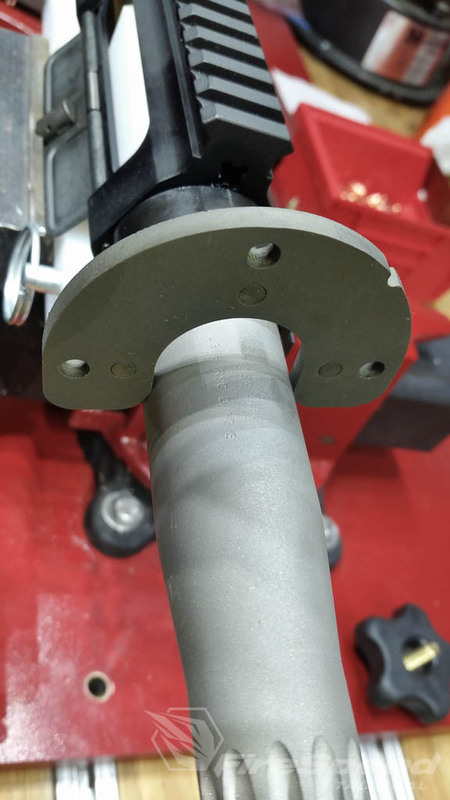 From what I gather, they had a previous barrel nut design that required indexing vs this new design which you just torqued the nut to spec and it was good to go. Where I ran into a problem was with the new barrel nut and the bull barrel (Rainier Arms 308 UltraMatch), none of my adapters or wrenches would fit! Here you can see the standard ar10 style pinned adapter wont fit around the barrel. I contacted Gem State Armory (G.S.A.) and asked them if I had ordered the wrong adapter. Jeff, the Owner of G.S.A. contacted me to help me figure out what was going on. 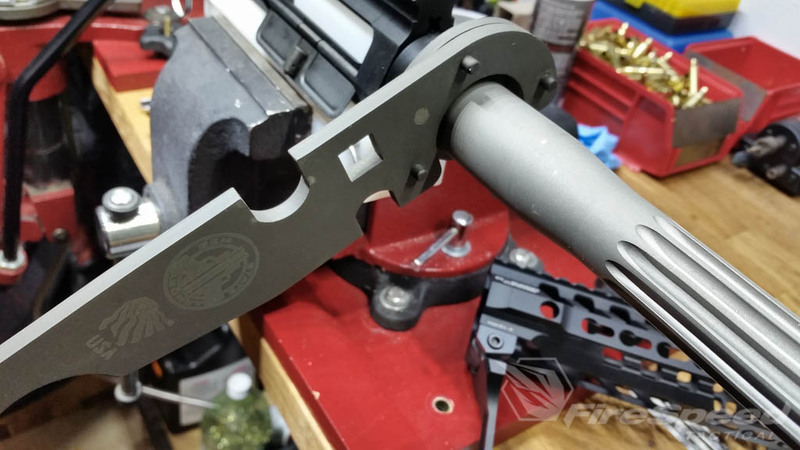 After corresponding back and forth is when we figured out that Fortis/Rainier changed the design and we were able to figure out the specs for a new adapter to work with the new nut and bull barrel. Final Product! Adapter fits like a glove! Here I am starting to crank it down. I completed the install with my torque wrench inserted into the 1/2″ drive port. 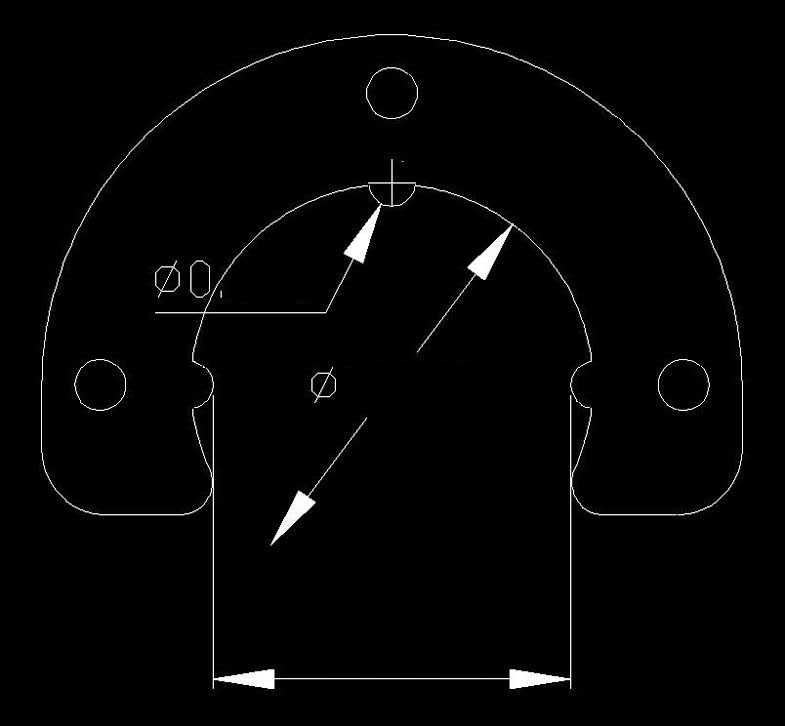 Now that we got the problems solved of torquing down the barrel nut, now we can talk about the solution bringer! The Gem State Armory wrench is made from 1/4″ thick steel and there is a magnet embeded into the wrench to make sure the adapters stay in place while aligning the wrench on the nut you are tightening. The other nice feature of this wrench, is that it is only ONE wrench. You can order additional adapters as you need them and conveniently store them. On the other end you have your castle nut wrench. I wanted to show the difference between the cheap $5 castle wrench and the G.S.A. wrench. The G.S.A. has three times more surface area to secure against the castle nut to prevent any damage during install. Cons? 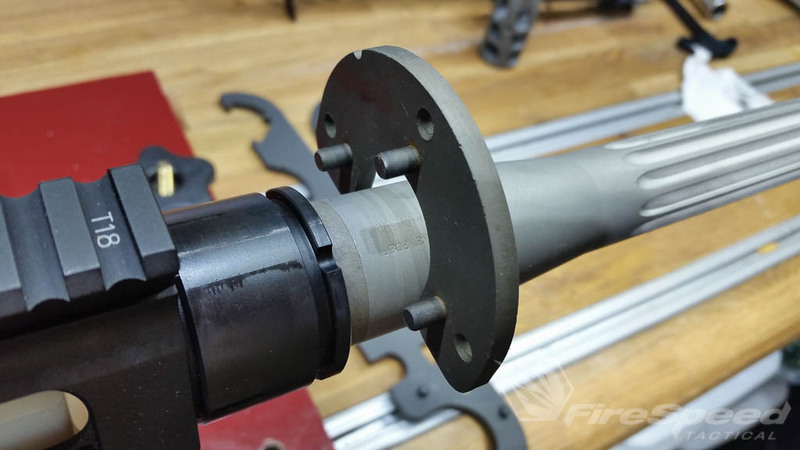 there was only one thing I can think of to change which is either to make it 2″ longer for additional leverage strength, or to bevel the edges of the spine of the wrench where you exert force while tightening or loosening the barrel nut. My soft, supple hands hurt a bit during some heavy torquing. 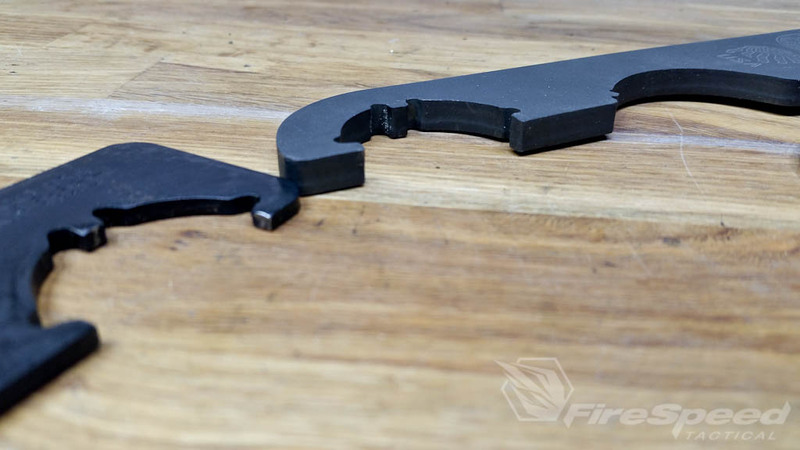 This is the ultimate AR wrench to own. 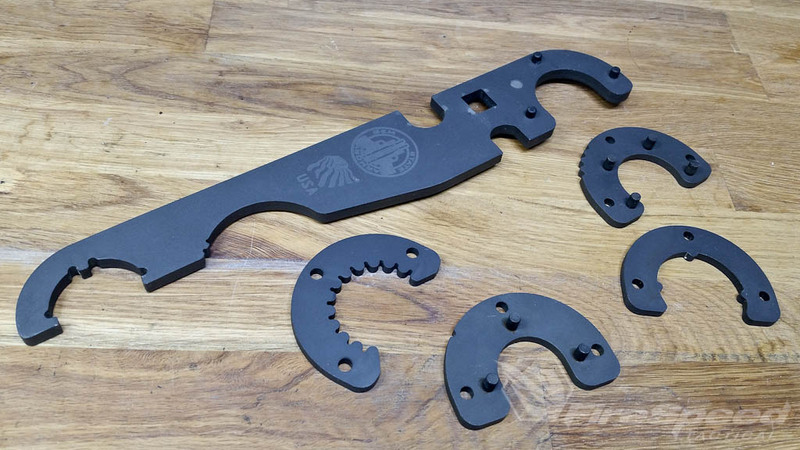 Each wrench comes with the standard 5.56/223 adapters for use on almost any AR platform. What sets this wrench apart from all the others is that the quick change adapters make this wrench capable of working on other AR platform calibers from 5.56 through the 7.62. 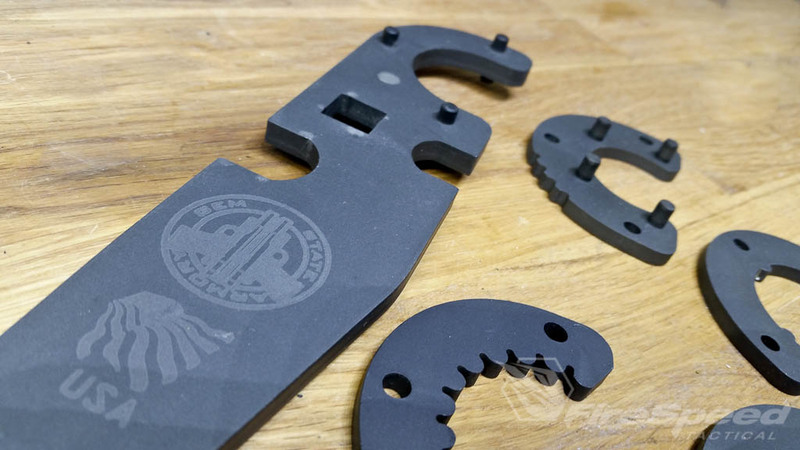 Precision laser cut, mil-spec parkerized, and laser engraved, each adapter has a scallop cut into the top of each for easy identification. Made from 1/4″ steel and 100% American made. One standard Delta Ring Style Adapter as well as customer choice of listed adapters. Adapters also available for DD and Larue. If you need a specific adapter contact Gem State Armory by email or phone.